Great view! The beach is just 500 metres away! Parking reserved. Guests may enjoy sunsets/dining on the terrace of this romantic apartment with with a sea view. The beach is just 500 metres away! The apartment has a cosy bedroom, open-plan kitchen/living/dining area with sofa-bed, flat-screen TV with DVD, WD TV and Air conditioner. Parking reserved. 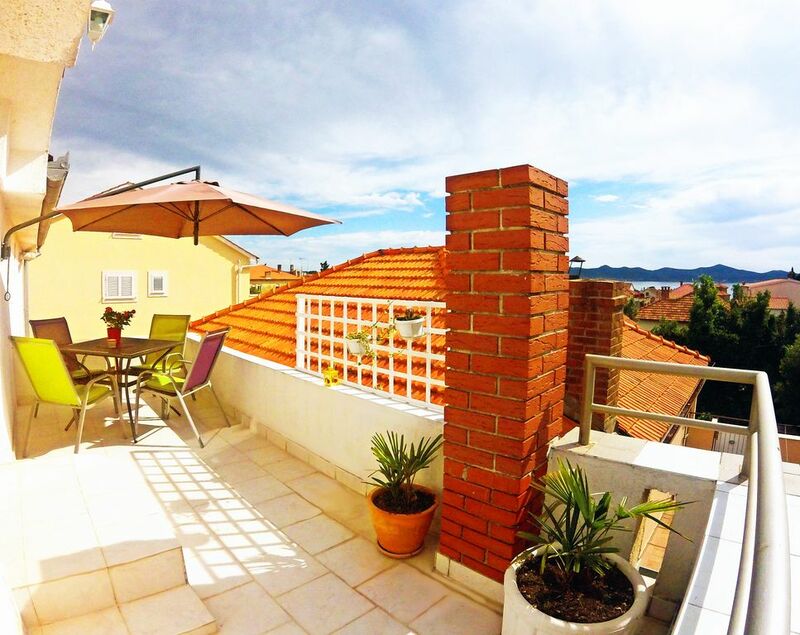 The apartment is in the elite area of Zadar, within walking distance of the beaches and old city. There are bars, restaurants and shops within walking distance. Airport is a 22-minute drive away. Zadar is one of the most attractive tourist destinations in Croatia! Our apartment is situated in the mansard of a private house in nice residential area of Zadar called Borik (family houses with gardens). From here you can go everywhere by foot; only 5-10 minutes to 4 nearby beaches (Uskok blue flag all equipped beach, Borik sand beach, Puntamika beach, Marex beach, Bamboo beach), 15 min to Zadar's old city centre, 2 min to bakery, grocery, farmacy, bus, restaurant... We have 4 beds (big bed for 2 in the bedroom 160x200 cm, pull out sofa for two in living room, 160x200 cm), 1 pul out armachair for possible extra one in the living room. Everything is fully equipped- including air-conditioner, fireplace, lcd flat tv, cable tv, dvd, wd tv, wireless internet, coffee maker, laundry machine, dishwasher, fully equipped kitchen with dining place with table and 4 chairs, toilette with a tub, 2 balconies with sea view, parking), it has 45 square meters, orientation south-west. It is just 200 meters from the shoreline and from the balcony there is nice view of famous Zadar sunset and sea channel and the island of Ugljan. This neighbourhood is a well-known tourist destination with numerous beaches, promenades, restaurants and renowned hotel and camping areas offering an array of sports and social activities. Borik has 8 km of beautiful beaches and boulevard on one side, and dozens of restaurants, pizza places, coffee shops and ice cream parlors on the other side. Andali apartment is just 5-10 minutes walking distance to the nearest restaurants, thai massage center & caffe, store, green market, bakery, pharmacy and bus station.Close by you will find places for relaxation and rest, but also places for night entertainment, sports and recreation and different kinds of organized excursions (Kornati, Plitvice, Krka, Paklenica...). Parking reserved. Internet entrepreneur, wife, mother, fitness enthusiast. We live in Split. It is peaceful residential area with private houses with gardens, apartment has a nice sea view. Close proximity (by foot) to different beaches, old town, food markets, bakery, coffee bars and restaurants is what makes our apartment fantastic for your stay. A very well equipped and comfortable apartment. We enjoyed our stay, the apartment is in a quiet residential area about 20 minutes flat walk to the old town. Closest beach is Boric 10 minutes walk. Sonja, who gives you the keys and shows you the apartment is very helpful and welcoming but doesn't intrude on you unless you need anything. There is a lovely balcony that is not overlooked to sit out on. A shop is nearby 5 minutes walk for any essentials. A few bars and restaurants nearby within 10 minutes walk. Very laid back friendly people, no hustlers or hassle. Just as it appears in the photos. Nice sea view. Upscale quiet neighborhood. Great value. And authentic Croatian style, which we were looking for. I loved having a bath tub! Lots of TV stations for adults and kids alike. Only reason for my 4 star and not 5 star is as a spoiled American I missed having a microwave to heat up leftovers from the great restaurants. The owners are really nice and helpful with directions and information. In addition, Zadar is a lovely mid size town with lovely sights, beaches and restaurants. Highly recommend it. We spent 8 days there. Thanks Lauren for your nice words. You were great guests! Very friendly and homey apartment. Greeted by a friendly mother-in-law we walked into a colourful apartment and loved it. It had all the needed amenities, and a couple of extras too. The location was quiet and the distance to Zadar and/or the beach was a comfortable walk with a good view. Shopping, bakery and drug store all within a 2 minute walk. Apt was clean and well-equipped. We have been received warmly. The hold stay was very beautiful and we have seen mutch interesting, beautiful things and places. Everyting proceeded smooth and absolute uncomlicated! Landlady and her parents are very nice and courteous people! The trip, location of the apartement, beach, absolutly everything was great!!! Thank you for everything! Thank you, you were such a wonderfull guests. Come again!